“Why do you have a statue of a dog on your front porch?” Stewart asked Louis. 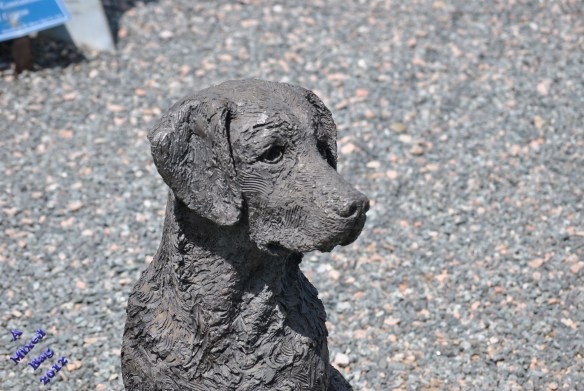 Louis rubbed his chin thoughtfully and answered, “That isn't just a statue of a dog, it is a statue of Rusty, one of the most amazing and my favorite dog of all time.” He trailed his last few words as he thought of his old friend. 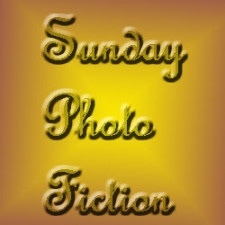 Al Forbes is our kind host for the Sunday Photo Fiction Challenge. He provides us with a photo prompt and approxiately 200 words with which we create our stories. The challenge is open to all who would like to participate. For more information, click on this link. To read the wonderful stories written by amazing writers, click here. What a lovely story about one man and the dog… Then you go and throw something supernatural into the mix, brilliant story! Gotta go get a statue of my dog 🙂 Love this and the twist at the end! LOL! You didn’t want it to end? Why the pout? It was Louise talking about how the light shown because Rusty was missing him too and that picture of the dog was too cute! Hence the pout. Ohhhhhh, hahahhaa, it was a happy emotional pout Pj. Hahaha, I just realized pouts are meant to be sad. Okay, I understand now. LOL!! Creative story. I like that the statue glows when it feels love. It makes you feel that the dog is there even though he’s long gone. Thank you Mandi, yes it does. The dog is telling him he loves and misses him through the statue. That supernatural element gave it a real zest. Very creative and touching story!Cool hint of supernatural! Great story about a man and his beloved dog. Great job. Lovely story. Dogs are my favourite and you wrote a loving story, no wonder the dog glowed. Very sweet tale about Louis and Rusty! I also thought it was very nice for Stewart to ask more about the dog, when Louis first told him. So many times, the other person will chime right in with a story about their own dog, or their own ideas about pets. To have someone say, “That’s important to you? I’d love to hear more,” that’s the mark of a good friend. That’s true Joy – I think you are right. The ending completely fitted the story’s mood. Excellent! Deb, I know that you are following my blog, Flash Fiction for Aspiring Writers. I just sent out my challenge post for this week about 5 minutes ago, did you get it? It isn’t coming into my inbox. No, it should be in my email right? Or where do I find it? In your email, if you have requested to receive it by email. UGH! Well I have finally figured it out and am all set…or so I think…do you want to resend to me or do you want me to click on the site and do it that way? I can’t send it again or it will go out again to everybody. I guess you’ll have to go into your reader to see it. Everyone seems to be telling me they received it, but I haven’t received it in my email although I am signed up for that. This is so frustrating!! No problem! I’m sorry this is happening. I don’t usually have to go through this but occassionally, WP throws a kink in things. I just posted my story let me know if I did everything correctly, thanks! Okay, that’s great Debbie! I will check it out in the morning, I’m on my way to bed. To have a friendship that powerful that gives you comfort even after death parts you. Beautiful Priceless.